While we start with Elizabeth being abducted by an unknown party with chapter 1, we skip backward in time to her university studies in England in chapter 2. Moments of her past are woven into these early chapters, so we see why it's so important for her to go somewhere new all on her own, even though no one from her university had ever been to Damascus to study before and she had no contacts. Pride can be a dangerous thing, especially for someone untested yet eager to prove herself, and Elizabeth is no different. As a reader, I am even less aware of the Arabic language and customs than she was as a student, so her interactions with families in Damascus is a great way to learn the little details that aren't told in travel guides. It's interesting about the etymology of the phrases used, or the traditions regarding guests, mosques, and bread. 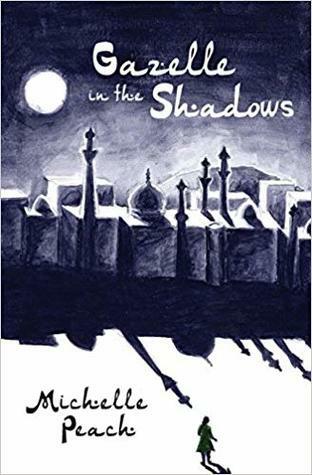 The views and life in Damascus in the 1990's is vividly described because Elizabeth isn't in the touristy spots. There's an almost romantic air to her views of the city and people, so it's easy to see how she's drawn into her relationship despite the warnings of one of the women she is staying with. Once they finally tell her outright what the relationship actually is, she realizes (as I did chapters before) that she was being used. She seemed to bounce back, but then came her harrowing experience with being kidnapped, and afterward finding out more about the people she had thought she knew. This is at once a suspense story and a coming of age one, loosely based on Michelle Peach's own life experiences. Syria was "safe" at the time, in part due to the secret police in the aftermath of the Gulf War. Even so, tension in the region remained high, and there was a considerable amount of fear and suppression for the people. There is a sequence which relates the political scene at the time, stressing the precarious situation that Elizabeth was in. All of the descriptions and tension comes across very well in this book.